Here’s one that’s slowly becoming an annual tradition. The Truffle Tree. This usually involves a week-long one -[wo]man truffle creating extravaganza that leaves my fridge full of containers hosting hundreds of truffles. This year, I decided to downsize the effort a little bit. One tree instead of two. Which basically meant a few hundred less truffles than usual. Oops. 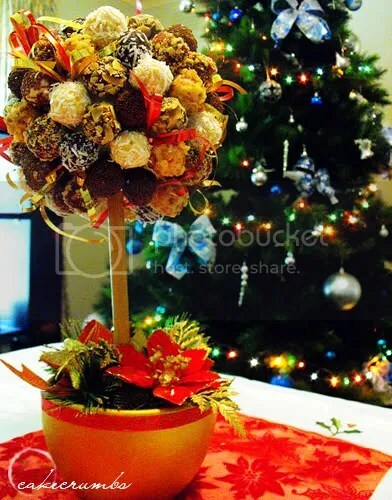 The truffles are displayed on a tree composed of a terracotta pot (which I decorated with gold paint, ribbon, and an assortment of Christmas decorations) a 30cm piece of dowelling, a polystyrene ball (ensure not to go too large here, or you tree will become top heavy and fall over – trust me, I know!) and toothpicks. Simple as. 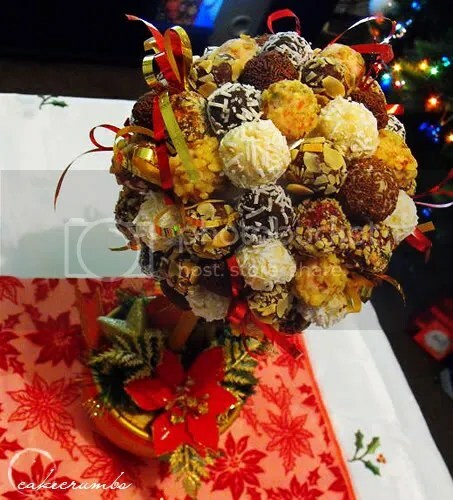 The truffles are arranged on the toothpicks and any gaps are filled with ribbon to match your theme. This is why it’s important that the truffles are firm at room temperature. Or they will melt and fall off. Not too solid, though, otherwise your guests will find them too solid to remove from the toothpicks! I reserved 8 of each of the smoothest mixtures (i.e., not the ones with nuts and biscuits in them to make them rough) for my mini puddings. 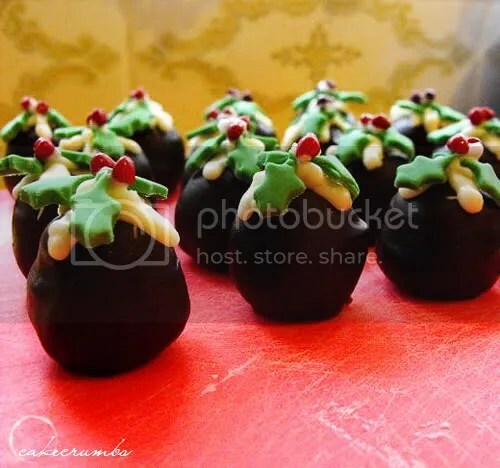 These were dipped in dark chocolate, decorated with piped white chocolate, green fondant holy leaves and red coated chocolate chips. These were originally intended for the goody bags, but time constraints coupled with my sister cutting the cellophane too small rendered them difficult to wrap. So they just got served on a platter. The true genius here (note: sarcasm) was that I completely forgot to separate the two truffle flavours before coating with chocolate. Meaning, there was only one way to find out what was inside: om nom nom nom. Notes: I didn’t use an alcohol in any of these recipes. I dislike the taste and hence never include it in any of my desserts. In some cases I substituted, as noted. But I mainly just omitted it altogether. 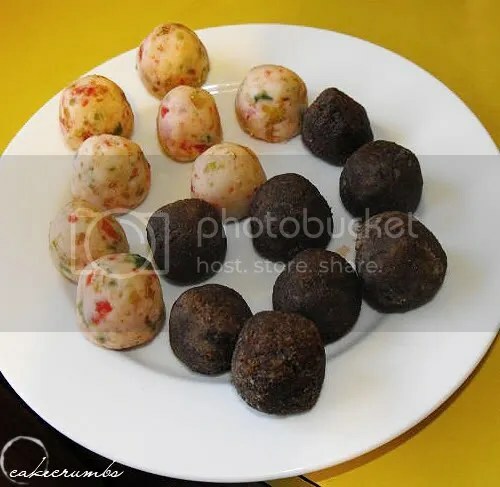 Also, you can save yourself a lot of hassle (as I did with two of the recipes) by picking one or two of your favourite truffle recipes and just alternating the coating on the outside: this gives the effect of alternating truffles, without having to do 7 or 8 or more (as I have previously done) batches of them. 1. Melt chocolate over hot water. 3. Beat butter until light and creamy, beat in yolk. 4. Stir in cooled chocolate, &frac14; cup of the almonds, finely crushed biscuits, glace fruit and Cherry Brandy. Mix well. 5. Roll tablespoons of mixture into balls; toss in remaining almonds to coat. Cover; refrigerate. 1. Combine fruit and brandy in bowl, stand overnight. 2. 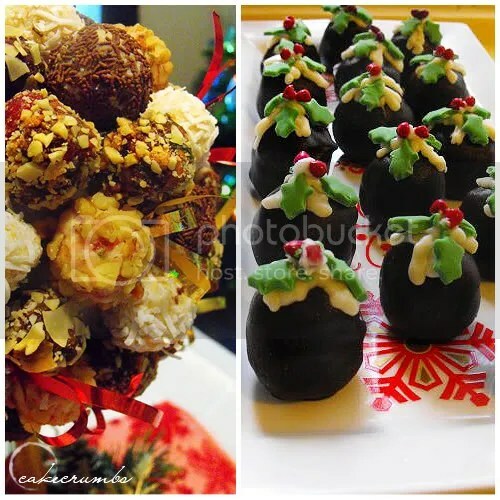 Melt chocolate and butter over hot water, add chocolate mixture and sifted icing sugar to fruit mixture. Mix well. 3. 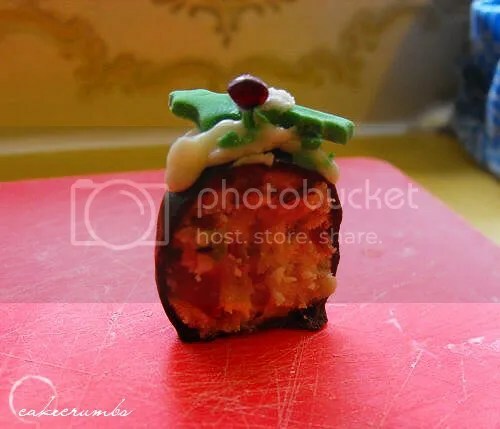 Roll tablespoons of mixture into balls, toss in walnuts. Cover; refrigerate. 1. Toast almonds on oven tray, in moderate oven for 5 minutes. Cool. 2. Melt chocolate over hot water. Stir in cream, ground almonds, sifted icing sugar, unbeaten egg white and liqueur. 3. Press mixture together; roll tablespoons of mixture into balls. 4. Toss balls in flaked almonds. Cover; refrigerate. NB: I used extra biscuits and added icing sugar. I also used shredded coconut to cover half the batch. 1. Combine the butter and cream in a small pan and stir over low heat until the butter melts and mixture is just boiling. 2. Pour hot cream mixture over the chocolate and stir until the chocolate melts and mixture is smooth. 3. Stir in cake crumbs and rum. Refrigerate for 20 minutes, stirring occasionally, or until firm enough to handle. Roll teaspoons of mixture into balls. NB: Alternatively, you can mix in more crumbs (or biscuits) and icing sugar to firm the mixture enough to handle straight away. I prefer to do this, as truffle mixtures that aren’t firm at room temperature have the tendency of falling off the tree upon being served.